After the launch in January of Ginger & Sanders‘ “Charity of the Year” whereby for every property sale that is made a donation is given to the Salvation Army, the team were delighted half way through the year to donate a cheque for £500.00. This charity was chosen for a number of reasons including the fact it is based a few yards down the road from the Ginger & Sanders shop, but the main one being its 128 year link with Eastbourne and the vast number of community services it has to offer. This includes helping the homeless to get access to group activities, clubs, meetings, events etc. all for the residents of Eastbourne. 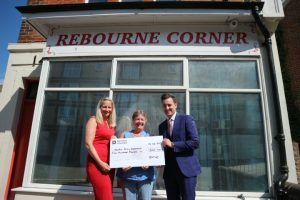 This particular donation is going towards Rebourne Corner who help the homeless & vulnerable people in Eastbourne with everything from food, shower facilities, housing and support etc. In fact, in the last 7 years over 83,000 people have received different acts of help and support. They offer an increasing range of services and activities such as a computer section, a job club, the rebourne allotment, haircuts and more, along with an out of hours emergency service. For these reasons the Ginger & Sanders team thought who better to offer financial support to by making them their chosen charity for 2018.The team looks forward to further supporting this charity and making another donation at the end of the year.